The Blue Yeti and the AT2020 continue to be the most popular microphones on the market. Unsurprisingly, both microphones have people who love them and people who hate them. 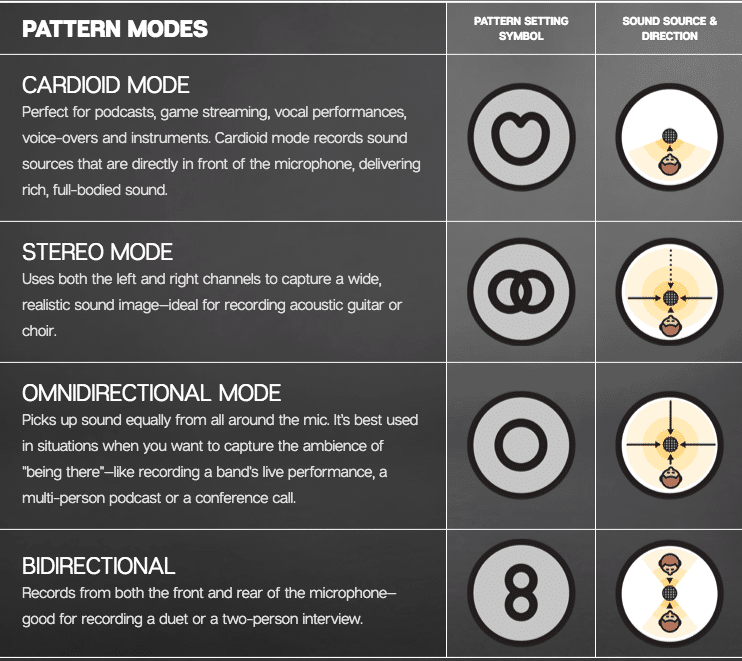 But when it comes down to the important aspects of a microphone, is there much difference? In this article, I'm going to show you a side-by-side comparison of both microphones. This will give you an unbiased look at both microphones so you can make the right choice for whatever your application may be. Here's a summary table if you don't feel like reading. If you are solely focused on sound quality you'll want to go with the AT2020/Scarlett 2i2 combo. Just note, you will be paying a little more than the Yeti but the sound quality will be noticeably different. Let's get started with one of the most important features of your microphone - the frequency response. Have you ever sat in your car and played with the EQ settings of your car's stereo? Did you notice how big of an impact it had on the character of the music? Well, it just so happens that each speaker has its own unique frequency spectrum. This frequency spectrum is going to be determined by a number of different factors (cone sizes, cone material, etc.) This frequency spectrum is one of the main determinants of how the speaker "sounds." As microphones are basically just speakers in reverse, they too have a frequency spectrum. This spectrum provides us with a quick and easy way to gain a sense of the quality of the sound without actually hearing the microphone. Manufacturers will typically provide the frequency range of the microphone. These typically are given in hertz and usually are somewhere in the range of 20 Hz - 20 kHz. Humans can hear from approximately 20 Hz in the bass to about 20,000Hz (20 kHz) in the treble. An audio device with a good frequency response is able to play all the low, middle, and high tones correctly and in the proper proportion to one another. As you can see, the Blue Yeti frequency response is fairly flat. This is one area where Blue microphones really excel. You can see a small bump around the 1 kHz - perfect for adding a little bit of brightness to your voice when recording. Notice it roles off around 50 Hz and above 10 kHz. The human ear doesn't really pick up much below 30 Hz or above 15 kHz, so having any excess audio information would just take up space. Otherwise, this frequency curve looks really clean. One of the reasons why the Blue Yeti has become so popular. 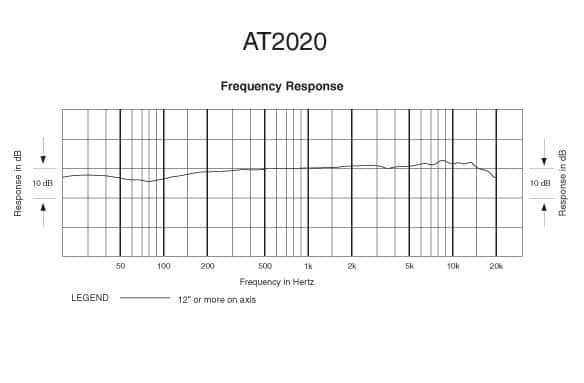 As you can see, the AT2020 also has a very flat frequency response. There is a little variation above the 5k mark, but otherwise, the curve is nearly perfect. There is a slight dip below 100 Hz but this won't be an issue if you are just recording vocals. Notice there is no coloring around 1k as seen in the Yeti. This suggests there won't be that added sparkle you'd get from the Yeti. However, this isn't really a big enough difference to differentiate one from the other. You can also see Audio Technica providing the ±10 dB variation. This range is expected within this price range. 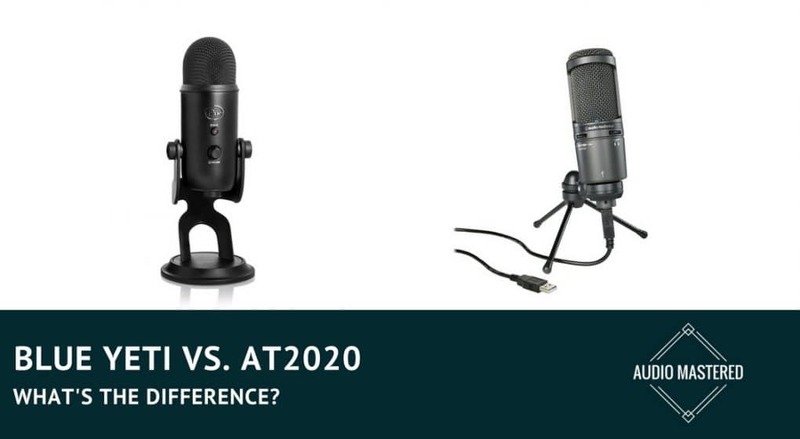 There is one main differentiating factor between the standard AT2020 and the Blue Yeti - USB. As the Blue Yeti is a USB mic, it requires an onboard analog-to-digital converter. While this drives up the price by almost $30, it does afford the user to be able to plug their mic directly into their computers. While you may see this as an additional expense, you save yourself from having to purchase an external A/D converter or an audio interface. This can be upwards to $100 in savings - more than paying for the difference of $30. The conversion from analog to digital is an important step as your audio moves from your microphone to your recording software. The two things we measure are the sample rate and the bit depth. 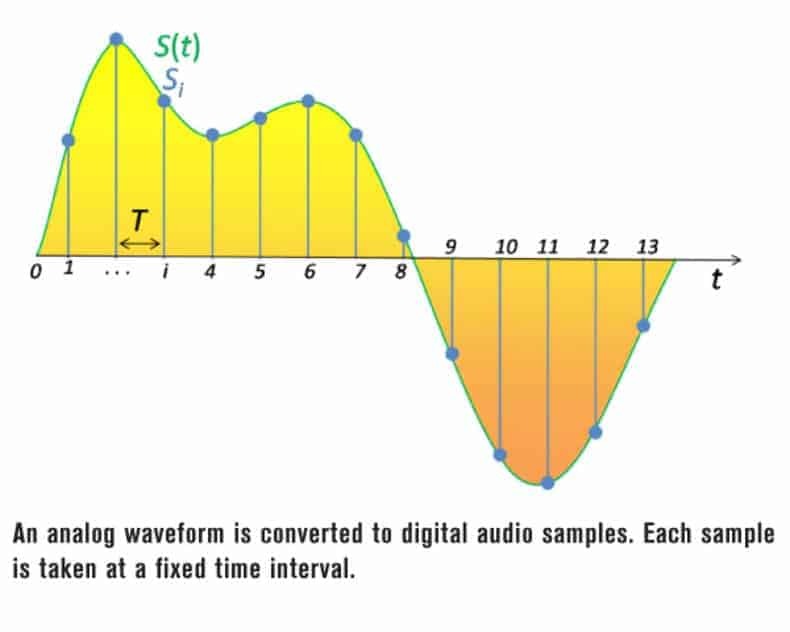 The sample rate is a measure of how many reference points your microphone will record over a given period of time. The higher the sample rate, the higher quality the audio recording will be. That being said, you aren't really going to notice much difference above 48 kHz. Anything above 48 kHz is going to be taxing on your system. The bit depth can be thought of as the resolution of the audio information. This can get quite complicated. To be honest, you will be totally fine recording using a 16 bit depth. If you are going to be recording for a professional studio you may want to look into things more and consider a 24 bit depth. 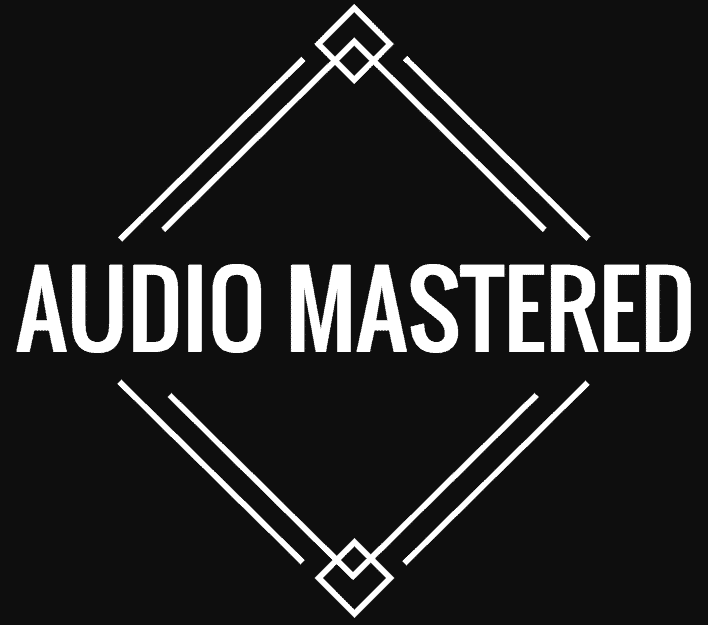 24 bit audio gives you a theoretical dynamic range of 144 dB, as opposed to 96 dB with 16 bit audio. However, this can all come out in the wash depending on your recording software. Again, 16 bit audio is totally fine for 90% of applications. The regular AT2020 doesn't have an onboard A/D converter. However, Audio Technica has offered a USB version. The AT2020 USB allows you to switch your sample rate so you can customize the mic to your use case - a nice little feature to have. What is the signal to noise ratio? Simply put, the signal to noise ratio is a measure of how sensitive the microphone is to background noise. As we are dealing with large diaphragm condenser mics, we need to be conscious of the S/N. In the case of S/N, the higher the number, the less obvious the background noise will be. As you can see, the Yeti has the stronger S/N ratio, edging out the AT2020. This suggests the Yeti will be less susceptible to background noise. A good thing to have if you are recording in an untreated room! The polar pattern of a microphone describes the sensitivity to sound relative to the direction from which the sound arrives. In other words, how well the microphone “hears“ sound from different directions. This is crucial for blocking out any background interference, say from the neighbour's dog or a passing truck. Having the right polar pattern can save you hours of post production editing. This is why it's crucial for you have a basic understanding of polar patterns and which pattern to use for each scenario. 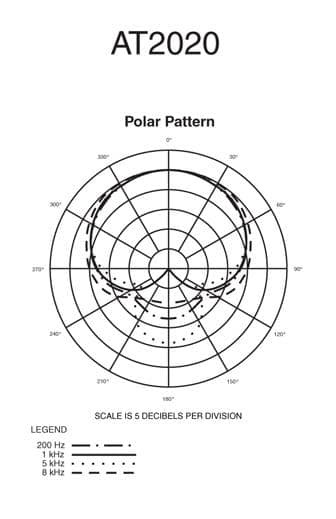 For most applications, you will be using what is called a cardioid polar pattern. This pattern picks up sound directly in front of the mic while blocking any sound from behind. Because of a unique capsule arrangement inside the microphone, the Blue Yeti offers multiple types of polar patterns. This increases the utility of the microphone as it's able to be used to record in different environments. As you can see, the Yeti offers 4 different use cases for each polar pattern. This is actually a huge leg up from the AT2020. Unfortunately, the AT2020 only offers a single cardioid polar pattern. The good news is, the cardioid polar pattern works well for 90% of the use cases. As I mentioned above, the AT2020 only has a single cardioid polar pattern. While this polar pattern will cover most use cases, I do award the Yeti a few more points in this arena. While you may not think you'll need all 4 polar patterns at the moment they are nice to have for future recording possibilities. The ease-of-use factors of microphones is often underestimated until learn you need 3 other pieces of equipment before you can get a half-decent recording. Ideally, we want a microphone that easily interfaces with a boom microphone stand and shock mount (here's the one I use and it works just fine,) that plugs directly into our computer with the need for any additional equipment. This way we can sit comfortably and avoid any shocks or bumps being picked up during our recording. The ability to monitor yourself using headphones is also essential to producing a high-quality recording. Therefore, the mic must be able to connect to a set of headphones and provide latency-free monitoring. Ideally, you will be able to control the volume of the input as well as the volume of the headphones on the body of the microphone. How Easy Is the Blue Yeti? Regarding ease-of-use, the Blue Yeti again comes out on top. It has all of the features I listed above. It even has the ability to quickly mute the microphone with the simple push of a button. You simply plug and play. There is no additional set up required. You can easily mount the microphone to a stand (here's a list of compatible stands) and it provides you the ability to monitor your recording without any latency. You can also change the microphone's sensitivity using the onboard controls as well as easily change the polar pattern with the flick of a switch. Really, nothing here is missing. To be honest, the AT2020 isn't terrible when it comes to ease of use, but it's not great. The original version only uses XLR output. Unfortunately, this means you have to buy some additional equipment in order for this microphone to work. The AT2020 also falls short of any onboard controls. You cannot monitor yourself using headphones, nor can you adjust any of the levels. The AT2020 only comes with one polar pattern. It is quite easy to hook up to a mic stand, so it has that going for it. I recommend you check out the USB version of this mic because it does sound fantastic - I just feel it's lacking in a few features. The Most Important Feature - How Does It Sound? So far you may be thinking that the Blue Yeti is the obvious choice, but don't buy just yet! Have a quick look at the video below for a quick comparison of the audio quality - you may be blown away! Not that he is using the Scarlett 2i2 interface.